Hello, lovelies~ The title of this post says it all. Yep. I have been 'Whoo'ed by a certain skincare from the land of ginseng. It all started with me getting bored with my current skincare routine and being the skincare junkie that I am, I went in search for new lands to conquer products. 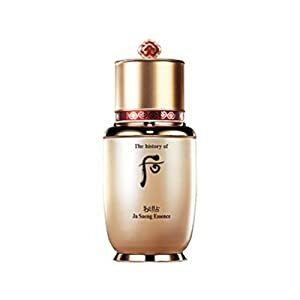 The choice falls to The History of Whoo from Korea. I've been meaning to give this a try a few months ago, but I put it off since I'm like a hamster who forgets things I have other things to try. Since there are more than one collection of skincare from them, I went on a meditative state before making my purchase. After that, I chose the Bichup Ja Saeng Essence. I bought the small 4 ml sample tube, so that wasn't at all like the full size one, duh. Just in case you wanted to see the full size bottle, here are the pictures with my sample underneath. This is my first time using an essence that has a lot of plant extracts that I was scared it would break me out. Some natural ingredients may be an irritant towards the skin, so choose them carefully. This part would be long since I wanted to explain a couple of the ingredients to you. The C14-22 alcohol is the good alcohol that doesn't dry out the skin and usually found naturally in jojoba. Caprylic/Capric Triglyceride acts as a solvent that helps stabilize the natural ingredients. It also increases the shelf life and improves the consistency of the product, making it easy to spread all over the face. Also, it is especially good for sensitive and oily skin since it is derived from specific parts of coconut/palm oil fatty acid. Water, Hydrogenated lecithin, Cholesterol, Ceramide 3, Cholesteryl hydroxystearate, C12-20 Alkyl Glucoside, Glycerin, Hydrogenated Polydecene, Caprylic/Capric Triglyceride, Stearic Acid, Glyceryl Stearate, PEG-100 Stearate, C14-22 alcohols, Carbomer, Triethanol amine, Dipropylene glycol, Glyceryl polymethacrylate, Propylene Glycol, Beta-Glucan, PEG, Biosaccharide Gum-1, Polymethylsilsesquioxane, PEG-150, Panthenol, Cyclomethicone, Phenyl Trimethicone, Velvet, Angelica acutiloba, Glycyrrhiza Glabra, Panax Ginseng, Paeonia albiflora, Ophiopogon japonicus, Scutellaria baicalensis, Angelica Gigas Root Extract, Cinnamomum cassia, Zingiber officinale, Zizyphus jujuba, Rehmannia glutinosa, Poria Cocos, Hydroxyproline, Glycosphingolipids, Phospholipids, Polybutylene glycol, dimethicone 1,2-hexanediol, dimethiconolmethyl trimethicone, cornus officinalis fruit extract, thymus yulgaris flower/leaf extract, dioscorea japonica root extract, typha angustifolia spike extract, ledebouriella divaricata root extract, atractyloides japonica rhizome extract, human oligopeptide 1, human oligopeptide 2, human oligopeptide 11, human oligopeptide 9, human oligopeptide 4, oryza sativa germ extract, acrylates/c10-30 alkyl acrylate crosspolymer trisodium edta, yellow 6. When I squeezed it out of the tube, a slightly thick brownish, orange liquid immersed onto the back of my hand. It looks sticky when I first saw it that I was afraid to use it. I can already imagine it having a sticky finish and hard to sink into my skin. Fortunately, all of my fear is for nothing. My skin gulped it like it was water! I apply a pea-sized amount or about a 1 cm diameter of this essence on my face and neck. I like to apply it thinly since I'm afraid that too much will give me acne. Despite the thick and sticky appearance of the essence, it sinks into my skin quite fast without me having to wait for a long time. The essence has a non-sticky finish, leaving my face smooth to the touch. My skin is a funny one. When it dislikes a product, it will immediately act up and leave an acne or two on my face. 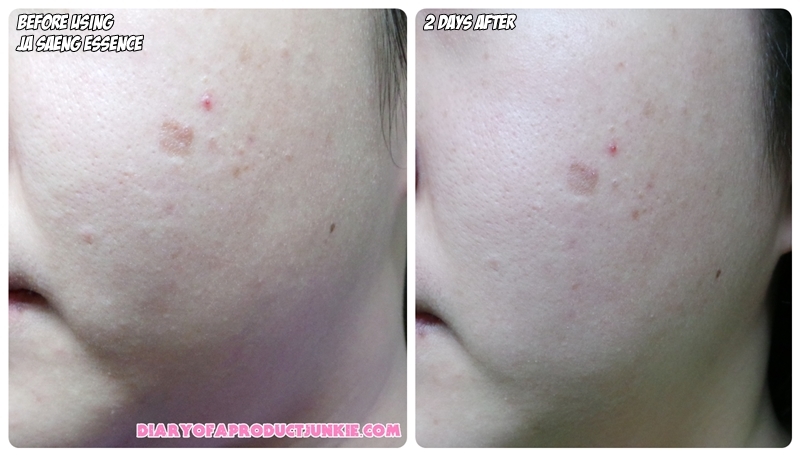 That usually happens fast within 24 hours starting from when the product is applied. I would usually take note and continue using the product for a 3-5 days, depending on how bad the acne is. If it's really bad, then I'll usually stop using it after 3 days. I took note within 24 hours after I first use the Ja Saeng Essence. I didn't see any allergic reaction such as redness, acne, or itchiness. I can already see the results within 2 days. However, I have to stop using this at the moment because I have a few skincare waiting to be tried out. In 2 days, I can see the bumps on my right cheek has reduced significantly. I showed the before after picture to Mr. G and he said, "You dead sure there isn't any mercury in that essence?". Hahaha.. Yeah, I was puh-retty sure about that, love. Anyway, maybe i'll try that when i could get my hands on the sample size. Hehe. WHAT? I mean. WHAT?! I want...! Anyone used the white serum from Whoo Singapore ?